One of the cool features that WordPress offers developers is the ability to hook into types of blocks and modify them with filters. This tutorial is an excerpt from my Advanced Gutenberg Development Course that goes in depth into how to extend blocks with JS Filters. You can also find a repo with some filter examples from the course. 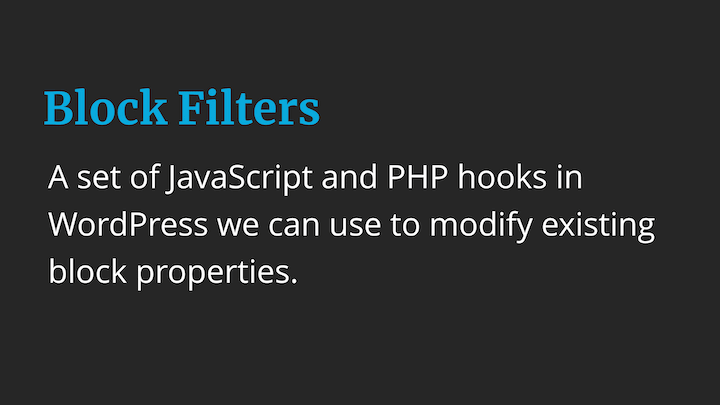 addFilter() comes from the WordPress Hooks library that is very similar to the PHP Hooks library in WordPress. You can checkout the talk below from one of the library creators, Adam Silverstein, if you want to learn more about the Hooks library and what it can do. Our custom callback function will look different depending on what filter we are hooking into, but here is what a callback function would look like that modify the name of the paragraph block. You can see here, just like PHP filters, we always need to return something from our filters (even if we don’t change anything)! What Block Filters Do We Have? At this time we have a number of helpful block filters. You can always check the documentation for a current listing of all block filters. This filter let’s us hook into and override any of the original settings passed to a block. This includes pretty much any default configuration you would want to change for a block, from it’s title and keywords to it’s attribute and edit and save settings. So, once we check that we have the code block, we can modify the title, description, icon, supports, and more if we wanted to. A note that this particular example uses loadash, so you would want to make sure that you have lodash included as a dependency when you register or enqueue your JS. There are more, and of course check the documentation, to see what might get added in the future. 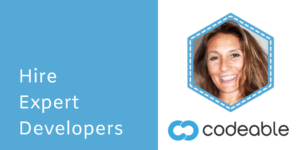 In my Advanced Gutenberg Development Course I go into depth on how to work with many of the filters mentioned here. Hopefully the above makes sense. Remember, any filter we hook into, needs us to return back what it is we are modifying (even if we don’t modify anything). This happens because the database has your block saved as one thing. Then the editor sees your new save setting and it doesn’t know what to do. 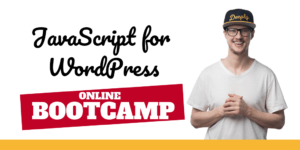 This will result in a message to the user that something is wrong with their block and it will want to convert the block to an HTML block with the content from the database. To avoid this, we can use the PHP render_block filter. 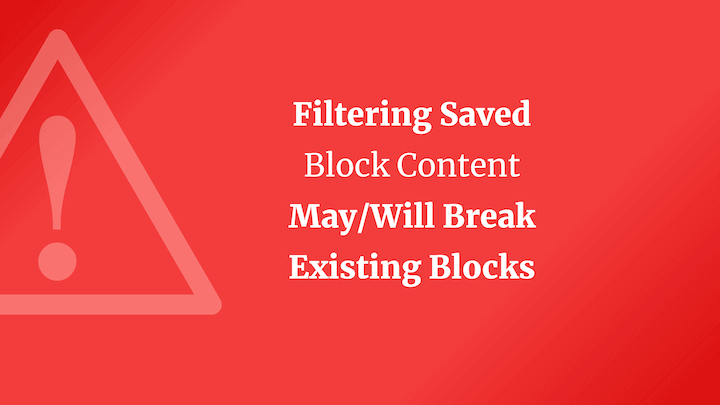 Filtering the block with PHP will cause the effect to take place when the block is rendered to the frontend and therefor does not interfere with the editor. Hope you enjoyed this article! 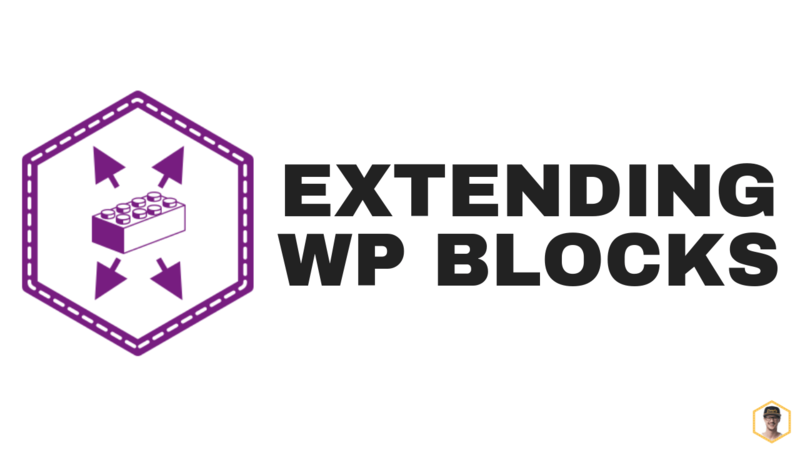 Please reach out with questions and suggestions on how you are extending blocks in WordPress!